The meat that you serve at your deli will dictate the response you get from customers. Choosing from these high quality meats will improve your chances of developing a loyal and satisfied customer population. 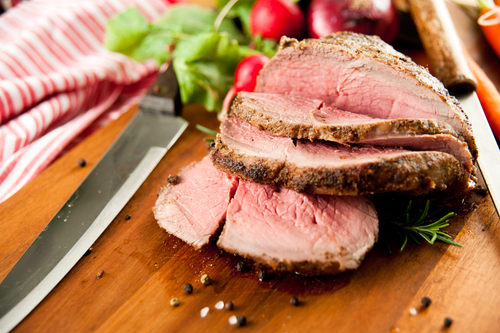 Roast beef is considered to be one of the most popular deli meats because of its rich flavor and palatable texture. High quality roast beef has a deep color and an appealing, cured aroma. Turkey is one of the healthiest meat options for your deli. Loaded with protein but low in fat, this flavorful meat is available in smoked, roasted or grilled forms and should be sliced very thinly when used in a deli sandwich. Ham is a traditional deli meat that is served on club sandwiches and in some grilled cheese sandwiches. Specialty meats that are spiced, seasoned, or cured are also popular accent meats on deli sandwiches. For example, salami is rarely served as the only meat on a sandwich, but it is incredibly popular as an accent meat because of its unique texture and delicious flavor. Similarly, pepperoni, a type of Italian sausage that is much spicier than salami, is often added to the top of a deli sandwich to give the sandwich a little extra kick of flavor. Some cured meats, such as pastrami and corned beef, are used as the sole meat on a sandwich. Corned beef, paired with Swiss cheese, sauerkraut, and Thousand Island dressing, form a traditional deli sandwich known as a Reuben sandwich. Adding these specialty meats to your deli lineup will allow you to please a wider base of customers. With the dramatic increase in diet-related consciousness throughout the country, many customers are looking for deli sandwiches that will contribute to an overall healthier lifestyle. Eating traditional deli sandwiches, comprised of red meat and cheese may not contribute to overall health when eaten on a regular basis, so it's important to have some healthier options available for your health conscious customers. Rotisserie or grilled meats, such as chicken or lamb, are great choices for a deli that wants to offer healthy and delicious sandwich options. Grilled chicken can be paired with vegetables for a delicious gourmet sandwich that won't feel like a health decision to a customer. Shaved rotisserie meats such as lamb, veal or turkey are also great in sandwiches and wraps. The meat that you serve at your restaurant is the heart of your deli. Customers will make an assessment of your entire establishment based on the quality of the meat that you serve. If you offer low quality meat that is flavorless or filled with artificial components, your customers will be able to tell. If you don't store meat properly and it starts to go bad or turn, customers will be able to tell as well. Also, if you are stingy with the amount of meat layered on a sandwich, customers may decide to go to another deli establishment. Choose the highest quality meats available, store them properly, and give customers ample amounts of meat in their sandwiches, and you can be assured that your deli will stay in business for a long time.